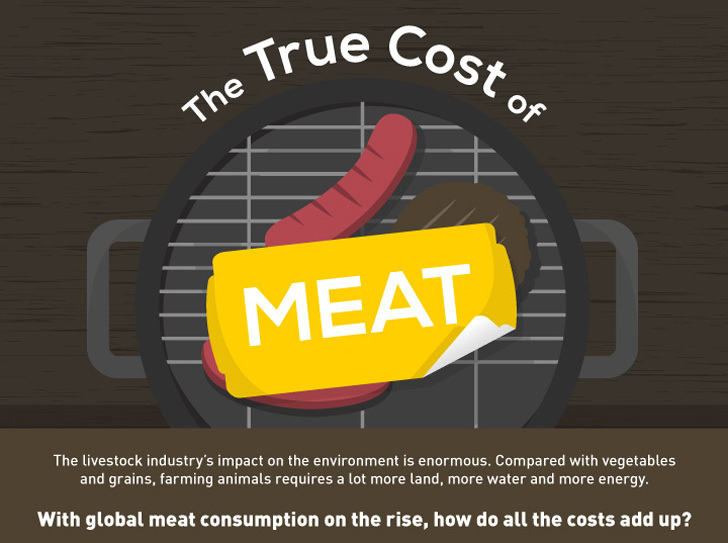 Do you know the real cost of a steak? We’re not talking about the dollars that people shell out to buy one, but rather the environmental cost of creating it? From the water and grain needed to feed livestock to the emissions created by huge herds of cattle, farming animals has a massive negative impact on the environment as a whole. Desertification, soil erosion, contaminated groundwater, and greenhouse gas emissions are just a few of the effects caused by raising animals for food. Check out the infographic below to learn more about just how much meat really costs in the long run, and why the planet would benefit a great deal if we all chose parsnips over pot roast.